Fhotoroom is one of the most advanced non-destructive image editors that utilizes a completely unique way of editing photos. 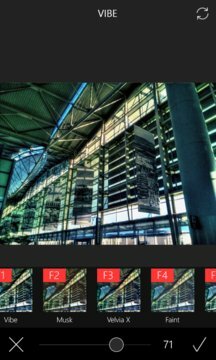 With a common and friendly user interface, fhotoroom's unique method of photo editing allows for larger previews and faster interactive editing making photo editing and experimenting a joy even with large photos. - Full Exif and GPS Metadata support. - Support for File Formats JPG, JXR, WDP, PNG, DNG, CR2, CRW, NEF, 3FR, MEF, RW2, RAW, ORF, PEF, ARW, SR2, KDC, DCR, RAF, MRW, MDC, SRF, SRW, X3F, TIF, TIFF, ERF, and IIQ. (Some formats only supported with purchase of the complete collection). - Editing tools like Curves, Crop, Resize, Rotate, Color Correction, Exposure Correction and more. - Interactive Editing for the highest level of control and accuracy. - Undo, Redo, Before/After during Filter, Pinch to Zoom. - Unlimited Undo with History List tool. - Beautiful custom designed presets each with a history and story behind it rather than just random stylish names like in other apps. 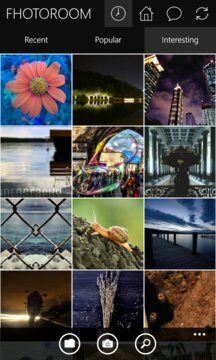 - 25 Custom Design Adjustable Styles like, Tsar, Tsaritsa, Americano, Mack, Classic Pro, Velvia X, Herc, Rain, Tinge, Cape, Komo, Kapla, Haze, Adele, Hazelnut, LowDef, Ansel, Silver, Dose, Aura 1 and 2.